Norfolk is widely considered the cultural, historical, financial, and urban center of the South Hampton Roads region. 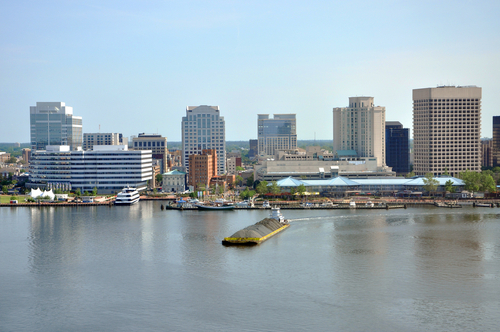 Thoroughly laced with waterways, and bound by both the Elizabeth River and the Chesapeake Bay to the north, Norfolk is a top-tier American port city and a strategic hub for international shipping, transportation, and military activity. Notable neighborhoods include Ghent and Larchmont near Old Dominion University, Ocean View, East Beach, Broad Creek, Ingleside, Lafayette-Winona, Lakewood, Norview, Poplar Halls, Talbot Park, and Wards Corner. Recent years have seen robust growth and revitalization downtown with substantial new investment in the shopping, dining, entertainment, and apartment renovations. The vibrant waterfront hosts hundreds of events and festivals annually, many of which are free to the public and the NEON arts district near the Harrison Opera House feeds an expansive art and culinary scene. Nearby is the Attucks Theater, built in 1919, it was and still is known as the “Apollo Theater of the South.” Norfolk is home to the world-famous Virginia International Tattoo, Virginia Arts Festival and the Virginia Symphony Orchestra. History buffs will enjoy strolling along the cobblestone in the Freemason neighborhood or visiting Saint Paul's Episcopal Church, which incredibly survived Lord Dunmore’s bombardment of the city on New Year's Day 1776. The stoic church still features a cannonball lodged in its wall from the historic siege. In more recent history, the Norfolk Botanical Garden was built by 200 African American women and 20 men through a Works Progress Administration (WPA) grant in 1938. Colonists began settling in Norfolk as early as 1636, but the city was incorporated in 1736. The symbol of Norfolk is a 41-inch long silver mace given by Lt. Governor Robert Dinwiddie in 1753. During the Civil War, Mayor Lamb successfully hid the mace underneath a fireplace hearth to avoid having it confiscated or melted down by Union troops. It is currently on display at the Chrysler Museum of Art. A city rich in history, Norfolk also shares a story of enslaved African Americans during the Civil War. With the arrival of Union troops, thousands of slaves escaped to Norfolk to claim their freedom. Signatures of the freedmen are housed in the Sargeant Memorial Collection inside the award-winning architecture of the Slover Library, one of the gems of Norfolk’s Public Library system. Transportation has been of the utmost importance in Norfolk since its beginning. By 1775, Norfolk was one of the most prosperous cities in Virginia exporting goods such as tobacco, corn, cotton, and timber. It was and still is a major shipbuilding center and port. By the late 19th century, the Norfolk and Western Railway established the community as a major coal export port. Lynnhaven oysters also became a major export. The Hampton Roads Bridge-Tunnel opened in 1957, connecting the Virginia Peninsula with the city. Norfolk is also home to the Norfolk Airport, an Amtrak station, The Tide light rail, Elizabeth River Ferry, and Pace Bikes. Norfolk is the hub of transportation for the Hampton Roads region. Once you’ve hopped on the light rail or rented a bicycle, many notable attractions are within range. You can visit the Maritime Museum, Nauticus, and explore the Battleship Wisconsin or visit the newly invigorated, Virginia Zoo. The Waterside District, Selden Market and the MacArthur Center are excellent stops for shopping and dining downtown. Ghent, Freemason, and Downtown are known for their amazing restaurants like Luce “best Italian food outside of Italy” and longtime staples, No Frill Bar & Grill and Hell’s Kitchen. Other local favorites are The Dirty Buffalo featured on Diners, Drive-ins, and-Dives, and El Rey #1 in Bayview is known for making their own tortillas. Whether you come to Norfolk to study, work, serve in the military, or play, we hope that you will call this region “home”. Let us help you find your home here.